In today’s technology-intensive research environments, petabytes of data may be produced in a matter of hours, days, or weeks. Those data may be lost in a similar amount of time if they are not captured, curated, and marked up in ways that allow for discovery and reuse by others. Datasets large and small can be very useful not only to researchers, but also to students, to the general public, and to policy makers. Among the classes of data of broad general interest are scientific records of the climate, the skies and galaxies, plant and animal species, social and economic observations, and cultural and historical records. Research policy by governments and funding agencies encourages – and increasingly requires – that investigators make plans for data management, curation, and dissemination. The National Science Foundation announced a new requirement in 2010 for all grant proposals: they now must include data management plans. In 2012, the White House initiated open access requirements on publications and data for all large federal funding agencies. Similar requirements are in place in the U.K., European Union, and elsewhere. These policies are causing a mad scramble for compliance by researchers, universities, librarians, and archivists. The library and archive communities have issued several reports on their role in data management, adding to a plethora of policy reports in this area. More courses and curricula for data management professionals are being developed. Data management is clearly a growth area for information studies graduates. These two courses (winter and spring) survey the rich landscape of data practices and services, including data as evidence and their role in research; data-intensive research methods; social studies of data practices; national and international data policy (e.g., intellectual property, release policies, open access, economics); comparisons between disciplines; management of data by research teams, data centers, libraries, and archives; technical standards for data and metadata; and data curation. Part I (winter) lays the foundation for data practices and services across the disciplines. Part II (spring) builds upon this background to provide practical experience in data curation. One large project will be undertaken across the two terms plus several smaller assignments. The courses will be graded separately. Part I is a pre-requisite for Part II. However, by taking Part I, you are not obligated to take Part II. These courses will be a mix of readings, discussion, practicum, field trips, and guest lectures. Invited speakers include local experts and distinguished guests, some via videoconference. Librarians, archivists, and other information professionals bring essential skills to the realm of research data. Information activities related to data include developing metadata, standards, and systems of classification, establishing archival plans for data selection, migrating data to new platforms and standards, creating finding aids for multiple user communities, and developing databases and technologies to support data creation, preservation, discovery, and reuse. Data management is a growth area in academic and special libraries, and will be an increasingly important set of skills for librarians and archivists in all sectors. This is an introductory graduate course, suitable for masters and doctoral students in information studies and in data-intensive research fields. The course is open to practicing librarians and archivists through concurrent enrollment, with instructor’s permission. Upper division undergraduates may enroll with instructor permission. 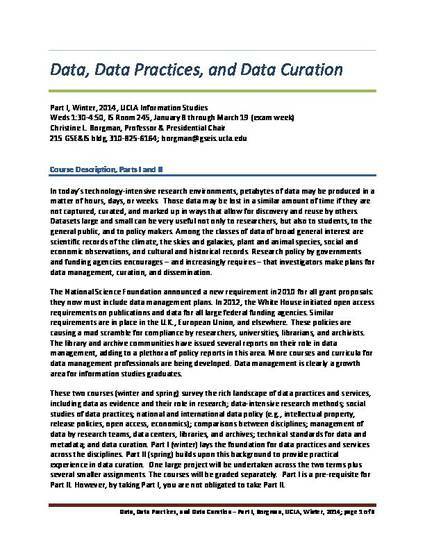 The two-part sequence of courses in Data, Data Practices, and Data Curation was developed, starting in 2009, with contributions by UCLA doctoral students Jillian Wallis and Laura Wynholds. Student participation also contributes to the development and adaption of these courses. Thanks also are due to instructors of similar courses at other universities who shared their syllabi and course materials, especially Margaret Hedstrom and Ann Zimmerman of the University of Michigan, Carole Palmer and Melissa Cragin at the University of Illinois, and Carolyn Hank at the University of North Carolina.